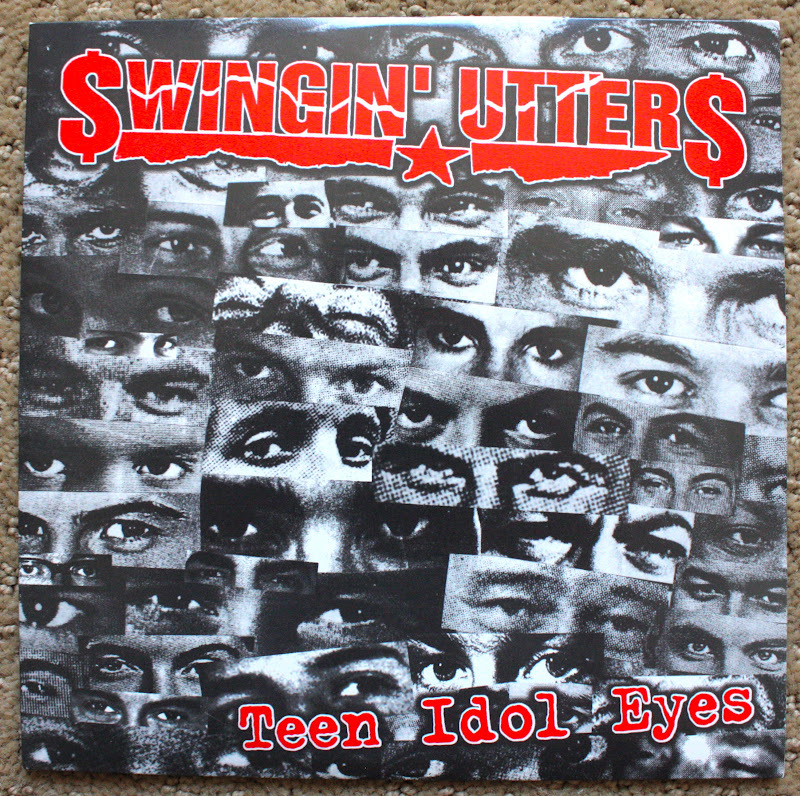 Here's my copy of Teen Idol Eyes by Swingin' Utters. 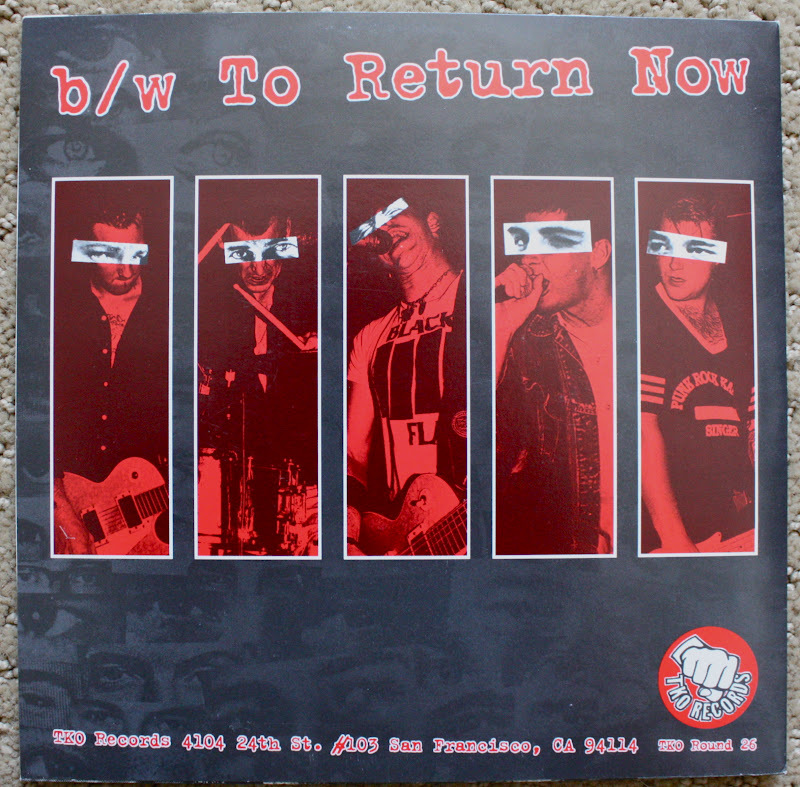 This is a really great 7" with a classic track that was on the Punch Drunk Vol. 1 Sampler. For being such an early TKO Records release by such an influential band, I'm surprised that these are still so easily available. You can even find them on the TKO Records website still! TKO pressed /300 on clear and /700 on black. That's actually alot of color copies for early TKO standards. Most of their releases were /100 on color. The Utters used to be a big freaking deal in the Bay Area. I remember when I was a little youngster they would always have the craziest shows and pack out every club they played, and were always incredible live. They actually still play often around here, but aren't as hyped and exciting as they once were. But when a band is around for almost 20 years what do you expect? I find it funny that alot of the LP's are cheaper than the CD's according to this old TKO catalog flyer that was included. You have to keep in mind this was 1999! No one wanted those pesky big wax things anymore, CD's were the king back then. It's sad that some of the most influential and important TKO Releases never even made it to vinyl, like The Beltones - On Deaf Ears, Pressure Point - Life's Blood and the Punch Drunk Vol. 1 Compilation. I've already sent TKO Records messages in the past begging them to re-issue these on vinyl but I don't think it's going to happen. But hey TKO if you want to send me that Bodies LP for $8 then I'll pay that price all day! Here's the Utters playing my favorite song by them, "No Eager Men" at the Gilman all the way back in 1995! Some of my favorite punk lyrics to boot: "He's just a shadow of what he used to be, until I put him in his place. She's just a memory that's scarred him horribly, just like the lipstick on his face. This side of paradise is slow, and no eager men go to a show, Except for me!"